Why Do I Need A Pet Life Vest For My Dog? A Pet Life Vest! You're Kidding? No I'm not kidding! You wouldn’t think of going out on your boat without a life jacket for you and every member of your family. After all it’s the law and besides, it’s just good safe boating practice. No matter how safe you try to be, accidents do happen. But, did you put a pet life vest on your dog? Isn’t she part of your family? Sure she is. She loves boating as much as you do. Many of us, when we first learned to swim, began by using the dog paddle stroke. It kept us afloat, it was easy to do and it didn’t require a lot of skill or strength. So surely, if there is a dog paddle stroke then all dogs must know how to swim. However, dogs are a lot like us. Some of them take to the water like ducks and others don’t do well at all. Some dogs which are naturally attracted to water are Retriever breeds, Spanish Water Dogs, Irish Water Spaniel, Irish Setter, the Newfoundland and the Portuguese Water Dog. Some of these breeds are even web footed. And then there are basset hounds, bulldogs, dachshunds, greyhounds and Scottish and Boston terriers which don’t do so well. Even if your dog is one of the breeds that swim like a fish, there are environmental conditions like cold water, strong winds and high waves which could prevent her from staying afloat until she could be rescued. Older dogs may tire easily, and breeds prone to hip dysplasia may have difficulty swimming. Dogs with low body fat may be more susceptible to hypothermia. So I guess what I am trying to say in this long and round-about way is that you should make sure your dog wears a properly sized pet life vest just as you require life jackets for the other members of your family. OK! Now you’re convinced; you’re going to rush out and buy your dog a pet life vest. But first, what are the U.S. Coast Guard requirements? 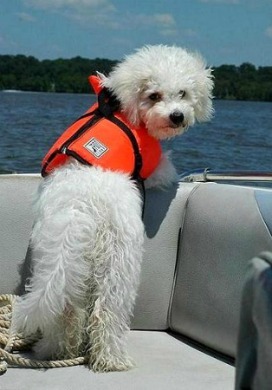 Unfortunately, or maybe fortunately, the coast guard doesn’t have any regulations on canine or pet life vests. Nor does the pet products industry have any standards by which to judge them. To add another obstacle in the way of choosing a pet life vest for your dog is the fact that dogs come in more sizes, shapes and anatomical configurations than humans. Price range of the life jackets was from $15 to $70. (Year 2000 prices). All the dogs were accompanied by their owner/boaters. All of the life jackets, except the one from TX Recreation Corp, buckle underneath the dog and around the neck which puts the flotation on the dog’s back or ribs. Also, they all had handles in the middle of the back except the vest from TX Recreation Corp. which had no handle. The life jackets clearly added buoyancy which would help a tired dog stay afloat until she could be rescued. The two photos above demonstrate how the buoyancy of the vest affects the dog’s position in the water. Each manufacturer uses different size guidelines. A small in one brand might be a medium or large in another brand. Therefore, you should take your dog with you when you are shopping for a life jacket to insure a proper fit. When fitting your dog give special attention to where straps, buckles and other attachments come in contact with the dog’s body. You want her to be comfortable wearing the life vest. Some of the life jackets were designed more for style than high visibility. A black jacket on a black dog was hard to spot. A handle on the vest makes it easier to bring your dog aboard by transferring the pressure to the straps that go around the midsection. Although these tests were done in the year 2000 and pet life jackets, like those for humans, have been improved over the years, they do show that they are quite efficient for what they were designed to do: keep your pet afloat until they can be rescued. 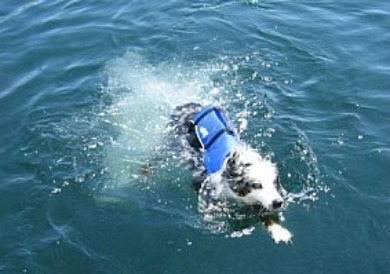 So what are the qualities you should look for in a life jacket for your dog? The most important consideration is fit. It should stay on when your dog is wearing it, and it should not come off when you lift her from the water. Not only should it not come off easily but it should be comfortable. Otherwise she will be miserable and will try to chew it off. Another important consideration is the strap handle on top and how it transfers pressure to the strap that goes around your dog’s midsection. The strap should be wide enough that it does not cut into the dog in an uncomfortable and harmful way. And finally, it should be easily visible when your dog is in the water. Again, you don’t want a black life jacket on a black dog. You want to be able to find your dog quickly, even when she is lost among the tossing waves. If you are interested in learning more about this test or the BoatUS Foundation, please copy and paste: http://www.boatus.com/pets/dogvest.asp. 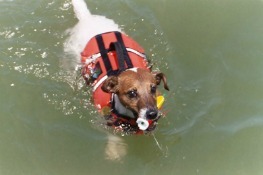 It has been over ten years since BoatUS conducted tests on flotation devices for dogs. As would be expected, there have been a lot of changes, so in the summer of 2011 BoatUS decided to take another look at life jackets for dogs. The results have just been published in the Fall 2012 E-newsletter from BoatUS Foundation‏. Parts of this page are excerpts from the article “How Safe is That Doggie in the Water?” taken from the BoatUS Foundation. Any errors in the facts are mine.